Grantam House Publishing, Wellington, 1992, 218 pages. Well-known historian Gavin McLean traces the history of firefighting through the last century and up to the present day, and tells of the fires that have destroyed lives (mercifully frew compared with deaths by drowning and on the roads) and property. 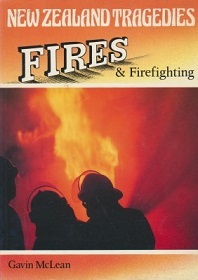 Thoroughly researched and written in a lively, approachable style, this copiously illustrated book also includes brief histories of all New Zealand's current fire brigades.